This is the summary of consumer reviews for Regalo Easy Step Walk Thru Gate. The BoolPool rating for this product is Very Good, with 4.20 stars, and the price range is $32.00-$32.99. 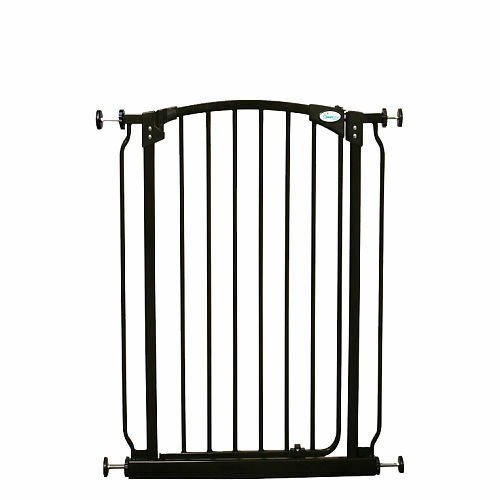 The Regalo Easy Step Walk Thru Gate is a 31" tall gate that fits openings from 29'' up to 40". It comes with an extension to extend it by 6". This gate when attached does not cause any damage on the walls. Also, the product can be installed easily. 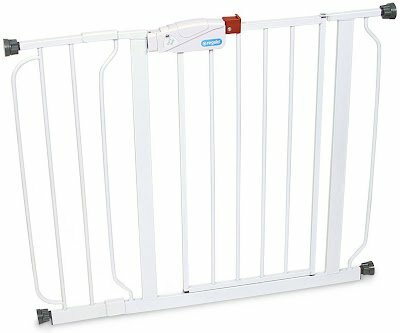 Sturdy and safe, the gate works great on keeping your dogs in or out. 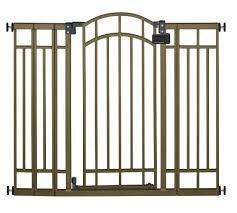 With decent looks, this gate is designed for convenience and durability. The latch is easy to open for adults but may be difficult for children to open. Overall, the Regalo Easy Step Walk Thru Gate is perfect for using at home when you have small kids or pets. It is easy to install and remove. The lever style handle offers an easy one touch release. This is a convenient walk through design and is perfect for doorways and staircases. the installation is super easy. They work great and are easy to install. recommend to everyone looking for a gate... easy install/use. The gate is very sturdy when properly installed. Installed this gate in a 35" doorway, with the included extension bar. My 11 year old daughter installed the gate in the hall by herself so that's how easy the set up is to install. Sturdy and easy to assemble and install. Easy to install, works great, granddaughter no longer takes baths in dogs water dish, really like the fact that no tools were needed. Installation was a snap and gate holds great. I purchased this gate thinking it'd be difficult to push down, once properly installed. Product info says it fits 40 in. My door openings are 32", fit without extension perfectly. An excellent, high quality product. It works just fine, I only wish is were more adjustable to fit the space. I thought this gate would fit my 40 in. I was going to order the 4" extension that should make it fit just right, but guess what??? Well, the reviewers were right. It says that it fits openings up to 40". I'm very satisfied with this product and highly recommend it for a purchase. The Regalo stays open if left open and the handle is just easier to work. The opening is too narrow. Easy to install, sturdy, and easy to open and close. But the draw back is that the gate is harder to open than the Regalo and it won't stay open without propping it open. so they left it OPEN, most of the time! Fits a variety of openings and doesn't damage the walls. Its easy for a 2 yo to open (unless it's locked, then she doesn't have the strength to open it). Easily open with one hand as long as they aren't on full safety lock. It's easily opened and closed with one hand, and swings in only one direction, so you may want to think about that when you install it. The walk-through opening isn't a wide as I'd like but not many of these type gates have wide openings anyway. Easy to install, works well and it's safe. Works well for the money. This gate is very simple to install and works really well. 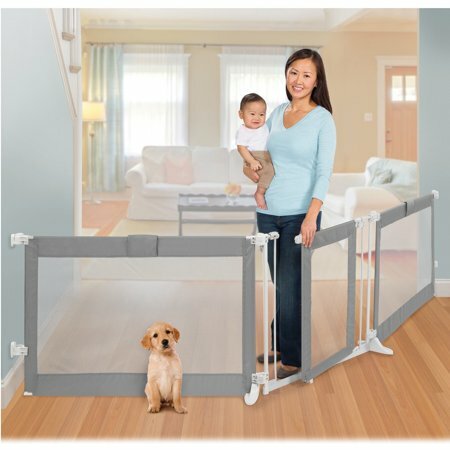 Please note - I don't know how well it works with a child, but for a dog gate, this works great and I'd recommend. The first I bought was a pet style one and it's worked well for 2 years. We bought this for our new puppies, then bought another and with a little work hooked them together to go across our kitchen area (8 foot) it works great as a barrier for two puppies. This gate works well, looks decent, and the opening isn't too small in my opinion, but I'm not a large person. The gate works well provided that your opening is less than 34 in or more than 37 in. Not the most intuitive gate, but of course, once you know how to use it, it works well and is easy to install. - Easy to open child proof latch. Easy to open the door, easy to latch it. The latch is kind of a pain to open when you've your hands full. My 11 month old son is pretty tall for his age (97th percentile) so I'm happy that the latch requires 2 actions to open it. My 18 month old son figured out how to open this gate!!! This gate has a locking mechanism that takes 2 steps to open on the same latch, but can still be done with one hand. Our daughter learned to open it when the red safety latch isn't engaged, but she can't get it open when it's. 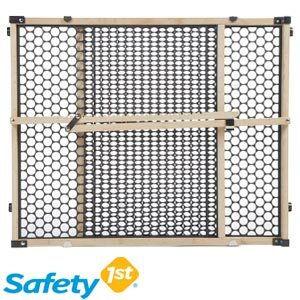 Great as a dog gate, which is my primary daily use, easier to open, could use a wider gate but doesn't slip on the wall because you use less pressure to open it than the 'Wide' version since they've different latching systems. An adult could easily pull back the red latch and lift the handle with one hand, but my little engineer in the making, though he can reach the top of the gate would find it nearly impossible to open.